Hundreds of people tonight packed the Great Hall at Manchester Town Hall, and cheered the premiere of a new film about North Manchester leading the way on all things green. The forty-minute film, “The Green Wave”, looks back from 2080 at the present day, and shows how a small group of people made a global difference. It was made by people in Charleston and Higher Blackeley, supported and guided by an innovative organisation called Reelmcr. The new Lord Mayor of Manchester, Cllr Mark Hackett, introduced the evening. He said that, as a councillor for Charlestown for 20 years, he was delighted to see the “skills motivation and talent that we know are already there” unlocked. He was followed by Manchester-based poet Tony Walsh, who spoke of the “journey of learning and self-discovery” that the cast and crew had been on, before expertly whipping up (even more) enthusiasm for the film. The film itself is book-ended with scenes of an elderly couple being interviewed about the year 2010. The female interviewee’s father is trying, with no success, to get his friends and family to take care of resources (and save money). For MCFly, the best quality of the film was how it captured the loneliness of ‘activism’ – the derision and gentle/firm telling-off activists can get when they try to raise uncomfortable issues. The film also looks (in an admittedly ‘short-hand’ way!) at the vested interests that stand in the way (a cartoon villain from the Hexagen energy company), and the ease with which people can be distracted or corrupted from the path of green-ness. Ultimately the message is one that anyone who has been paying attention these last twenty years can agree with- we can’t wait for governments and corporations, we have to act now (and bring them along with us). After the main film, which is filled with memorable performances from young and old, professional and amateur, the audience saw an interesting “making of” documentary, which explained just how interactive and collaborative the process of making the film had been. This was intriguing, and something all involved can be proud of. After that there were a series of speeches and presentations. Deputy Leader of the Council, Jim Battle gave a speech where he used the “f” word and the “c” word – fun and commitment. He was among a large number of people who gamely gave out awards to cast and crew. 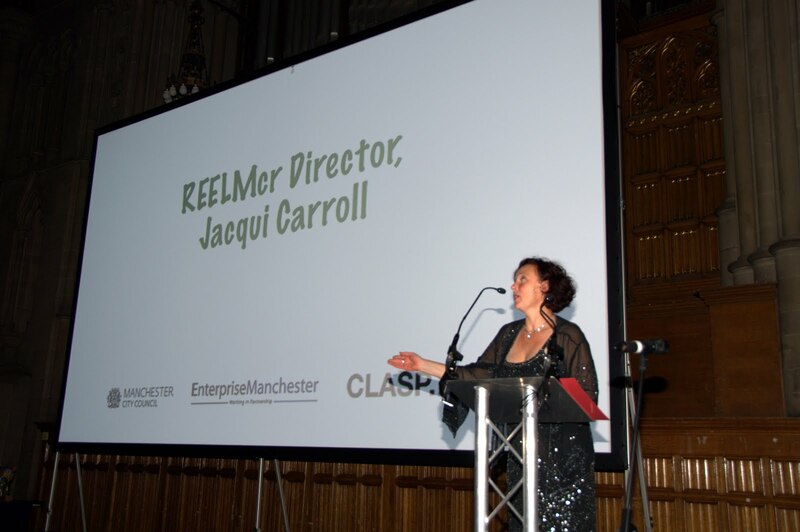 The loudest applause came for Jacqui Carroll, director of Reelmcr. The film was made with money from Manchester City Council’s Carbon Innovation Fund, Enterprise Manchester and the Climate Change Local Authorities Support Programme, with many other organisations and individuals donating time, skills and facilities. It’s great to see so much enthusiasm and concern. The challenge for all involved will be to harness that energy, minimise the inevitable falling off in participation, and choose new projects that will keep people involved and enable more to use their energy and talents. Given the good will, hard work and brimming talent on display already, this is very doable. This entry was posted in Manchester City Council, Reelmcr. Bookmark the permalink.